Remember me? I’m so behind thanks to work, packing, almost taking my entire knuckle off with a cheese grater and, oh yeah, sheer exhaustion. But I’m determined to catch you up on our trip to Florida, this blog’s third anniversary and all the other latest and greatest from Utah. Moving day is in less than two weeks, so let’s get crackin’…. 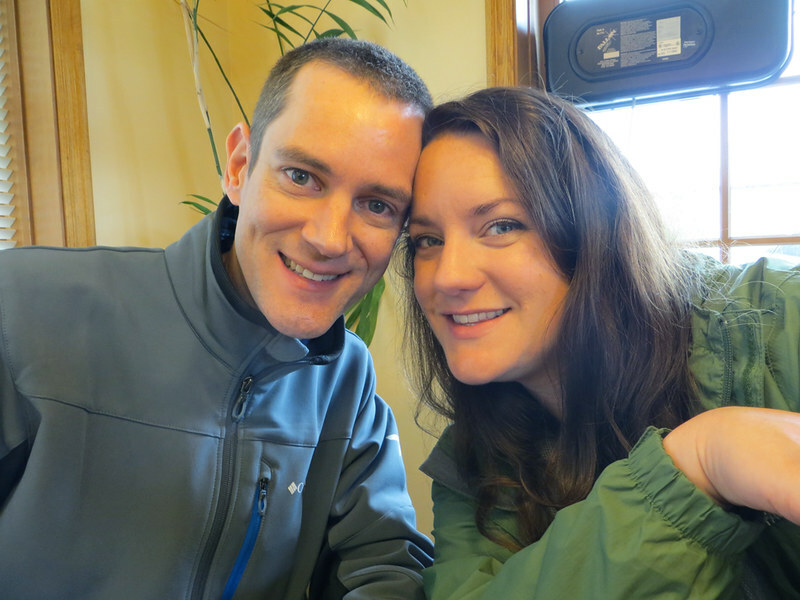 Joe and I celebrated anniversary #6 two weeks ago with a day of fun and Utah-bucket-list check marks. 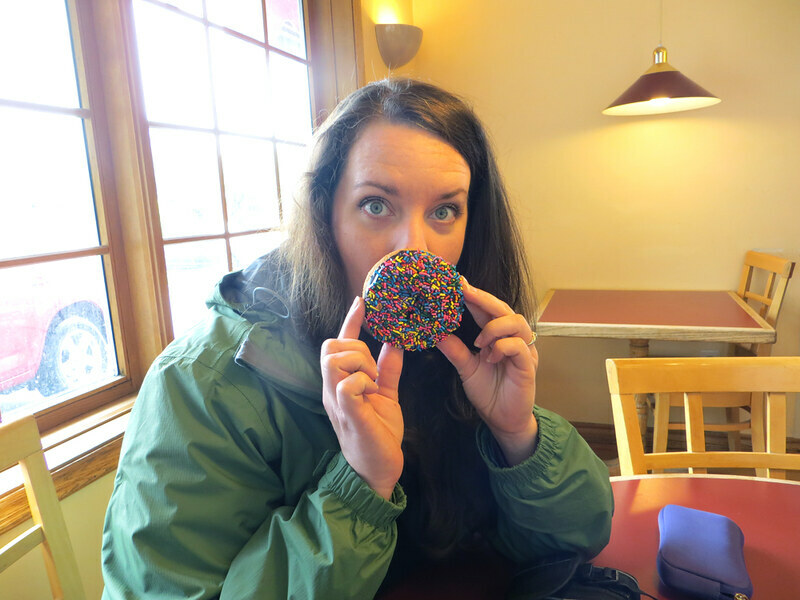 It was a rainy, dreary day, but we piled in the car and headed to Utah’s most famous doughnut shop: Banbury Cross in SLC. By the time we got there the line was still out the door (in the rain), so we figured that was promising. and Joe tried a chocolate cake with icing. 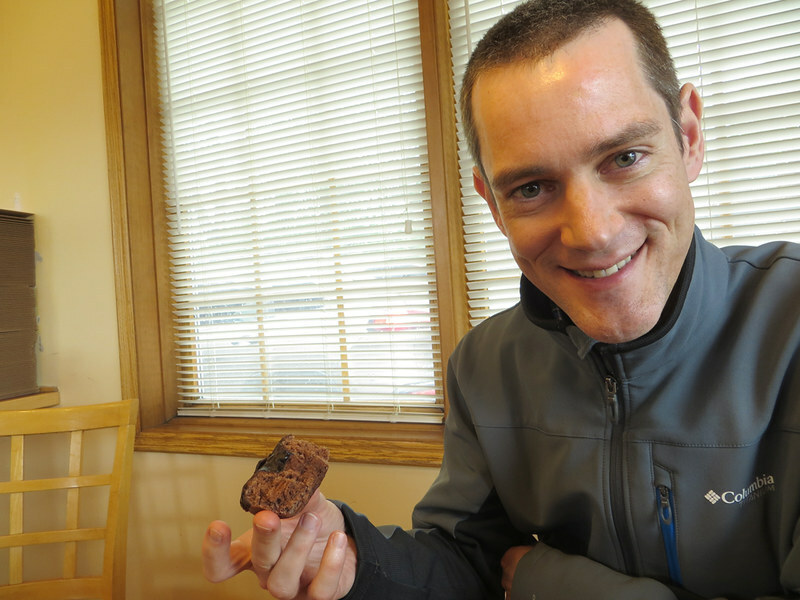 They were fine–not as good as Daylight or Spudnuts, but that didn’t stop us from digging in! 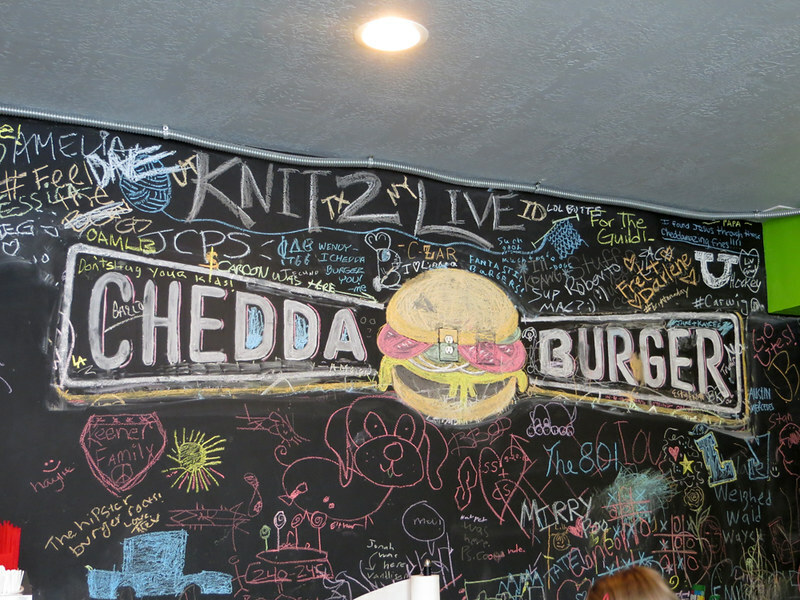 We shopped around some of our favorite places before checking out our main reason for driving 3-hours round trip: Chedda Burger. Joe had found the former food truck on Yelp. One look at their “Kill Me Softly” burger and he was sold. That would be a beef patty with bleu cheese, bacon, arugula and cranberry sauce on a Krispy Kreme doughnut. That’s Joe fainting..or his heart exploding…either one. 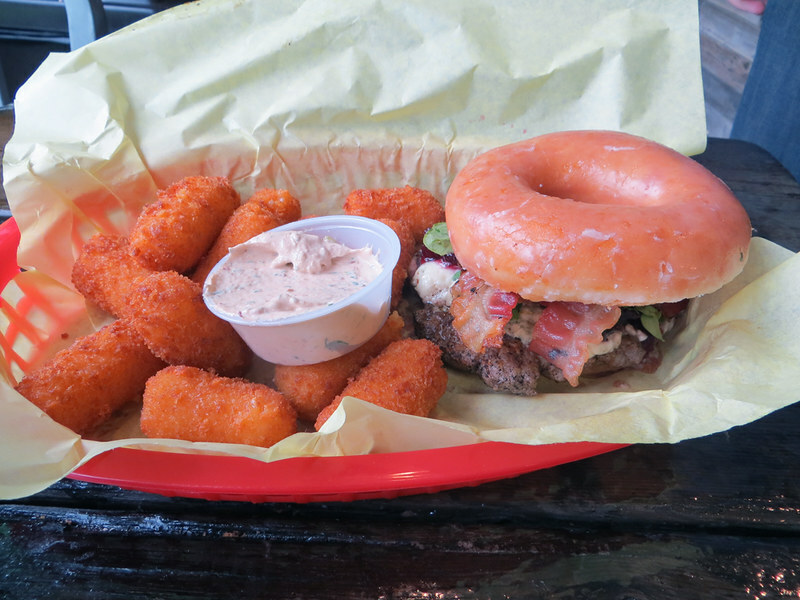 The best part was definitely the cheddar tots that Joe had with his burger. I could have eaten them all day, especially their cilantro chipotle dipping sauce. 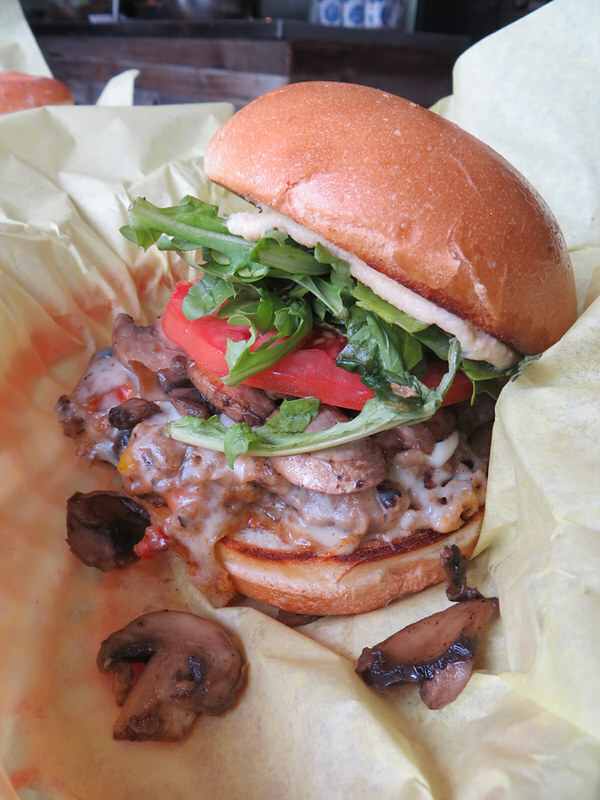 I went for the “modest” Hipster: veggie patty, brie, roasted mushrooms, tomatoes, arugula and hummus. Wowza. 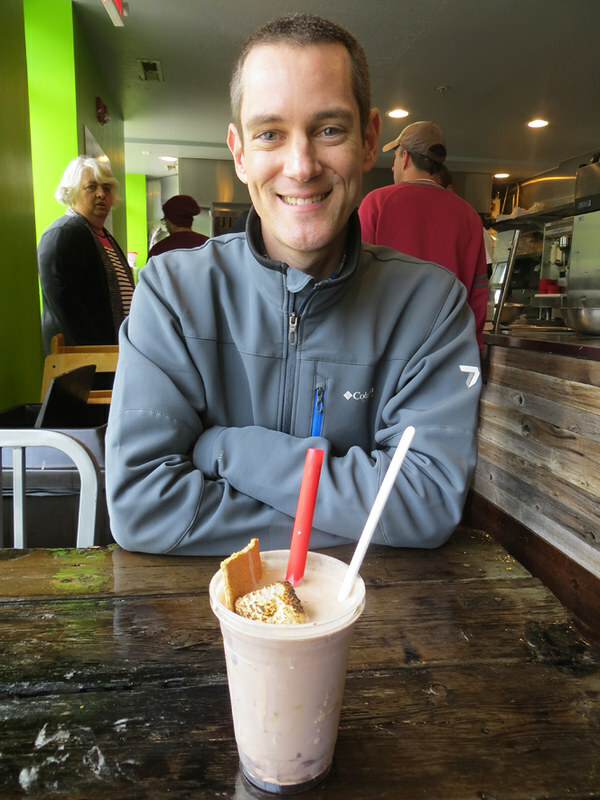 Then, to top it off…or make matters worse, we split their Urban Camp Fire milkshake — ice cream, toasted marshmallow, fudge, peanut butter and graham crackers. It was also magical. Sixth anniversaries are marked as either the candy anniversary by traditional standards and the wood anniversary by modern lists. I really wanted to use this to create a fun anniversary dinner at home for Joe. Candy I could do…but wood? 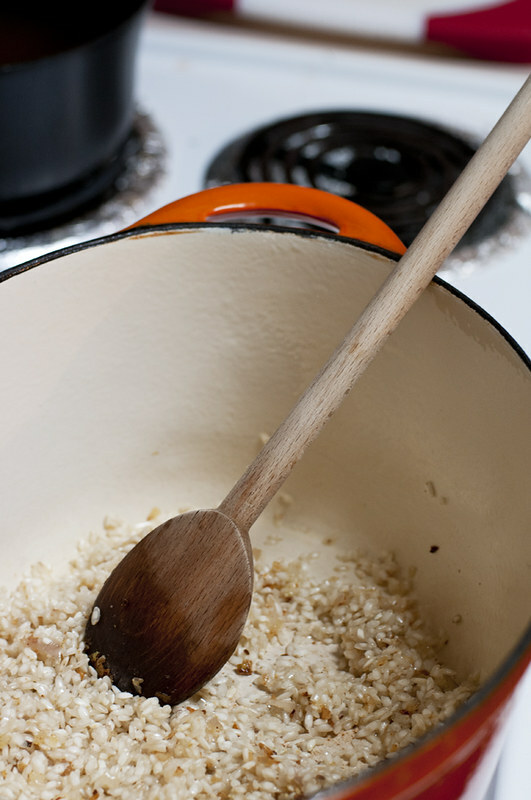 I wracked my brain before Joe came up with the perfect solution: Risotto. 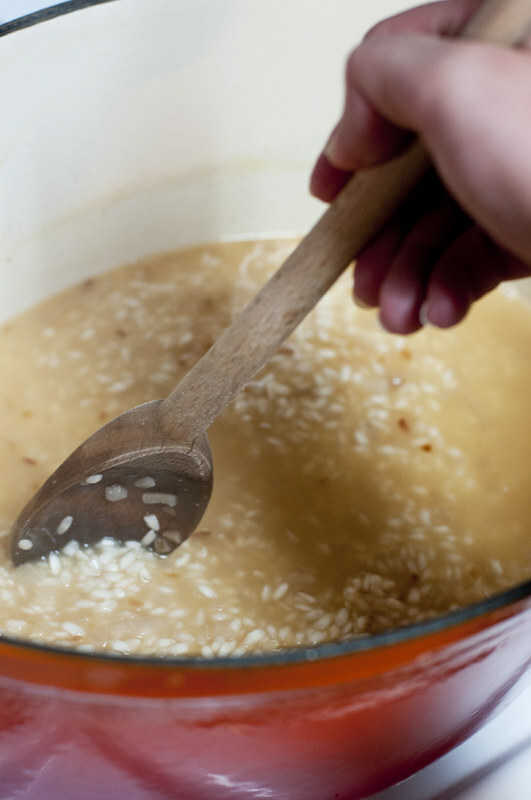 What do you need to make risotto? A wooden spoon. So we stood over the stove to coax out those incredible starches together with that wooden spoon and a bottle of wine. Totally my love language. 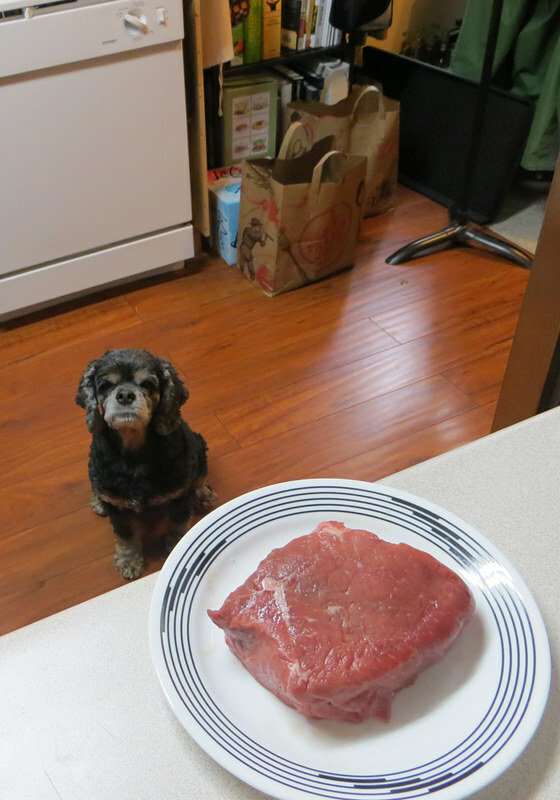 Joe paired his roasted sweet potato risotto with a steak, which was heavily guarded by Bella until it went on the fire. But, the dessert! I knew the “candy” theme would win, but I didn’t estimate by this much. 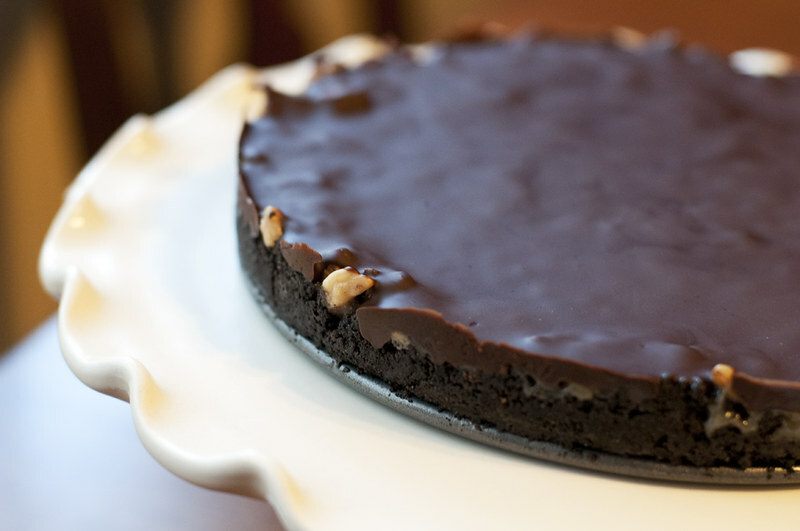 I made Baked’s (those Brooklyn boys I love) Easy Candy Bar Tart — a no-bake miracle. 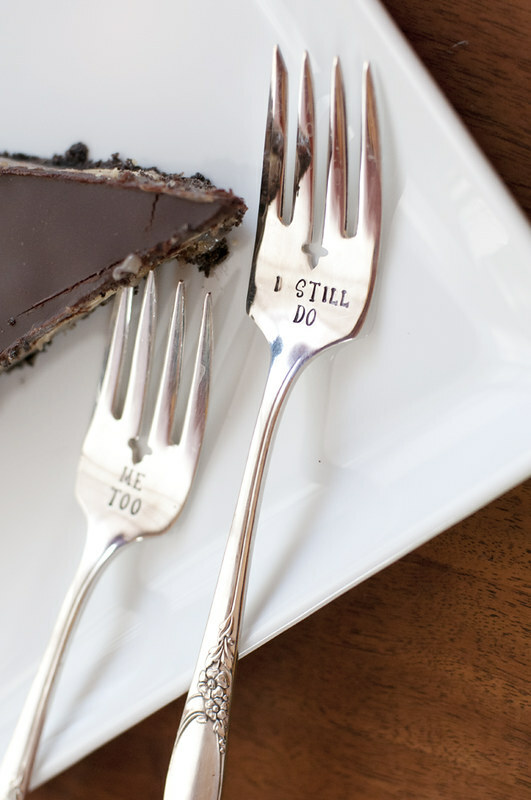 Especially when paired with our sweet anniversary forks from the Z’s. 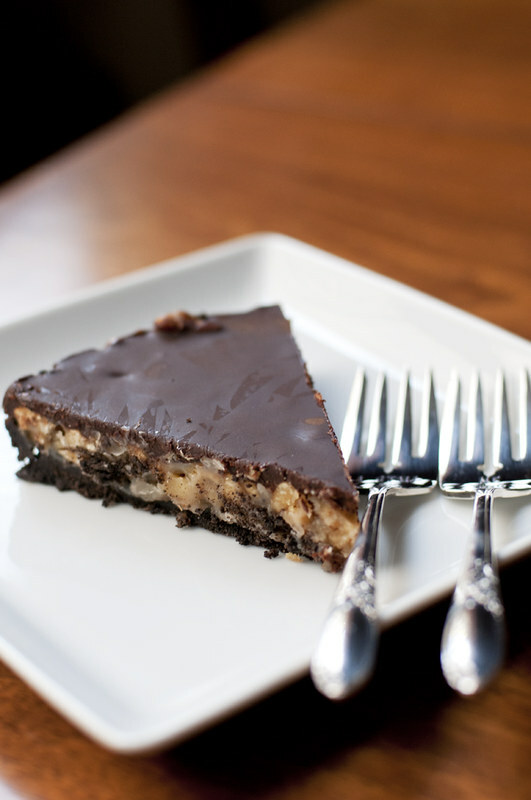 The tart starts with a simple oreo cookie crust, but then you top it with homemade caramel mixed with slightly over-toasted walnuts. Get ’em as smoky as you can without burning them. This would be a perfect don’t-you-dare-turn-the-oven-on summer dessert! Toast walnuts and set aside to cool. Lightly coat a 9-inch springform pan with cooking spray. In a food processor, pulse the cookies into a very fine powder. You should have about 1 1/2 cups. Place the crumbs in a medium bowl and stir in sugar. Pour the butter over the crumb mixture and mix until well combined. It should feel wet. 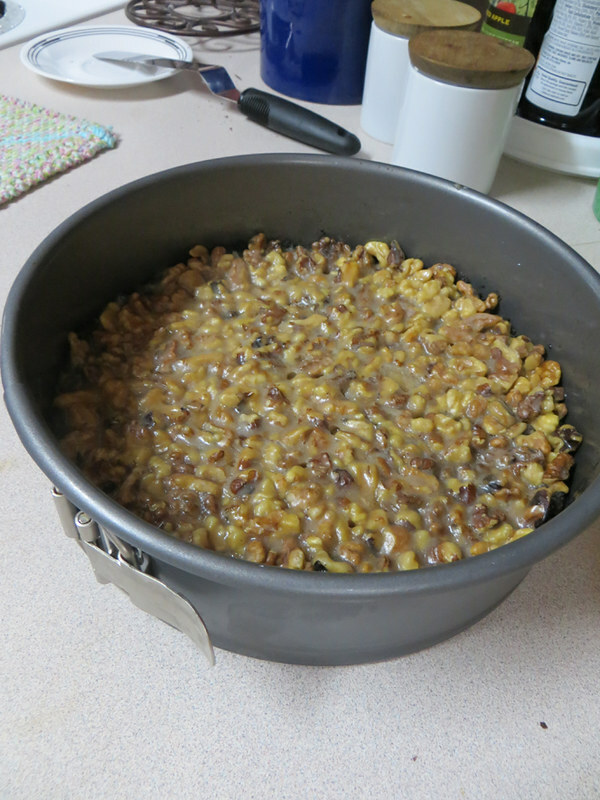 Turn the mixture into the prepared pan and press into the bottom and up the sides using a large measuring cup. 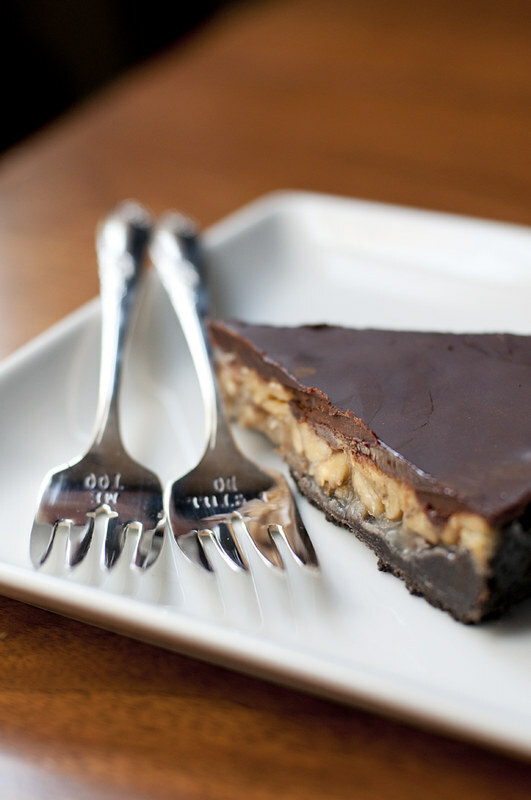 Put it in the refrigerator while you make the filling. In a medium saucepan with high sides, combine the sugar and 1/4 c. water. Stir the mixture gently so you don’t splash any on the sides of the pan. Cook over medium heat, stirring until sugar dissolves. Increase the heat to high, and, without stirring, allow the mixture to boil. Once it begins to turn a rich amber color, remove it from the heat and slowly stream in cream. After the mixture stops bubbling, return the pan to very low heat and whisk in the butter. Continue whisking gently until the caramel is uniform and slightly thickened, about 2 minutes. Stir in the vanilla and fleur de sel. Remove pan from heat and stir in walnuts. Pour the filling into the prepared crust and chill for at least an hour. Place chocolate, butter and corn syrup in the bowl of a double boiler over medium heat. Using a rubber spatula, stir the mixture until everything is combined and smooth. Remove the bowl from the water and stir to release excess heat.